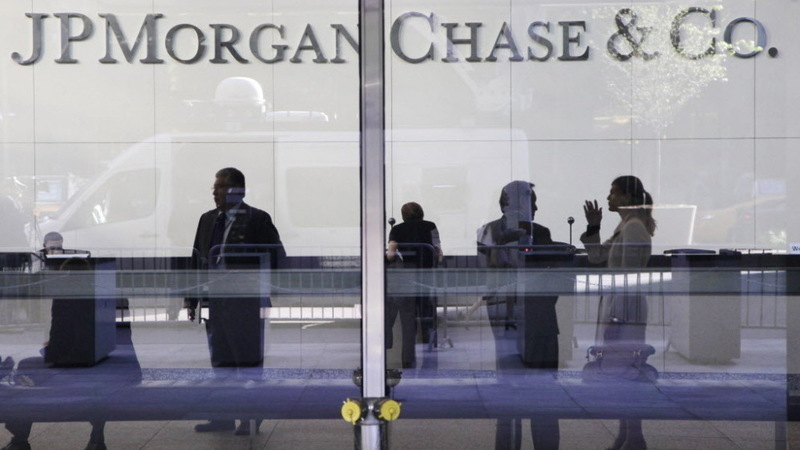 Reports: JPMorgan's Losses Could Top $4 Billion; Key Exec Departs : The Two-Way People familiar with the situation tell The Wall Street Journal that the bank's losses from a risky trading scheme will continue to mount in coming quarters. They also say, Bloomberg News reports, that JPMorgan may close the office responsible. Three high-ranking executives, including one of the most powerful women on Wall Street, are expected to resign from JPMorgan Chase this week because of their roles in the $2.3 billion loss the bank recently suffered when some risky trades blew up in its face. The Wall Street Journal, which broke that news, also reports that JPMorgan's losses from the "giant trading blunder" keep growing. It cites "people familiar with the situation," as its sources. "As of last Thursday the bank had lost $2.3 billion on a credit derivatives trade gone awry, but that figure grew by about $150 million on Friday, according to a person familiar with the matter. Executives are prepared for another $1 billion of possible losses this quarter from these positions, as well as another $1 billion of potential losses over the next year or so, according to someone close to the matter. That would mean a possible total loss of more than $4 billion, though the positions also could rebound in value, slicing any loss, the person noted." So far, at least, the losses have still not been large enough to overtake profits from the bank's other operations. But as concern about the size of the bank's losses and whether similar problems might occur at other financial institutions, The Associated Press says that "the bank will accept the resignation of Ina Drew, its chief investment officer," according to "a person familiar with the matter." The Journal adds that "Achilles Macris, who was in charge of the London-based operation that placed the questionable trades, and trader Javier Martin-Artajo" are also expected to depart. Bloomberg News reports that "Drew, 55, is one of two women on the operating committee at JPMorgan, the biggest and most profitable U.S. bank. Her office oversees about $360 billion, the difference between money from deposits and what the bank lends. [Chief Executive Jamie] Dimon had encouraged her unit to boost earnings by buying higher-yielding assets, including structured credit, equities and derivatives, in an expansion of risk-taking led by Achilles Macris, ex-employees said in April." Bloomberg also says that "the entire London staff" from JPMorgan's chief investment office — a few dozen people — "is at risk of dismissal." As we reported Friday, in announcing the loss on Friday, Dimon said it was "a bad strategy ... badly executed." Update at 9:15 a.m. ET. Drew's Retirement Announced: According to the AP, "JPMorgan Chase says its chief investment officer [Ina Drew] is retiring."